SVEIFAB offers some of the largest custom and structural steel fabrications. 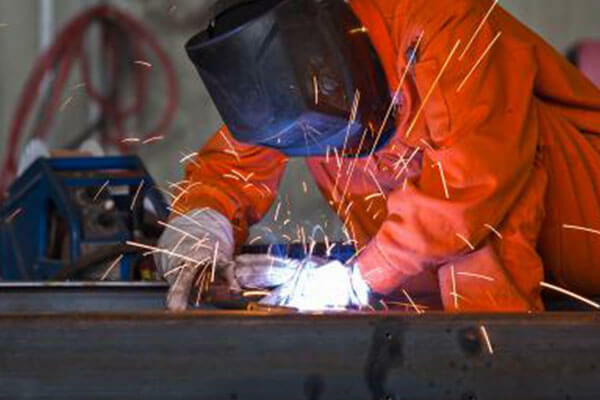 We have extensive knowledge of every aspect of heavy steel fabrication and the successful delivery of countless complex and large structures such as VFD cabinet, large duct frame, bulk storage, material handling, heavy structures, tanks, hoppers, and chutes for industries that include utilities, mining, oil & gas, industrial, alternative energy and solar. SVEIFAB are ISO 9001 & ISO 3834-2 certificated, and welding operatives are trained and EN ISO 9606-1 certificated. With both extensive knowledge and experience in heavy steel fabrication, SVEIFAB can provide you with exactly what you are looking for. Having worked in an extensive array of different industries, we believe our heavy steel fabrication capabilities are the very best on offer. Advantages of laser cutting over mechanical cutting include easier workholding and reduced contamination of workpiece. Precision may be better, since the laser beam does not wear during the process. There is also a reduced chance of warping the material that is being cut, as laser systems have a small heat-affected zone. Flame cutting can cut from sheet metal thicknesses to 100 inch material. The process for all thicknesses is the same and that is the material must be “preheated” to a temperature of 1,600-1,800 F degrees, then the pure Oxygen is discharged into the preheated area and the steel is then oxidized or burned, hence the term “ burning”. The quality of the final cut surface can be quite excellent with a sharp top edge, square/flat cut surface, and a sharp slag- free lower edge. SVEI have one set of CNC bending machines from DERATECH which is specially for heavy steel bending, maximum bending Length is 6m and max thickness can be bent is 20mm steel plate. SVEIFAB are ISO 9001 & ISO 3834-2 certificated, and welding operatives are trained and EN ISO 9606-1 certificated. Heavy duty fabrication requires using the correct type of welding to ensure structural integrity. MIG, TIG, Oxy-Acetylene, light-gauge arc welding, and many other welding formats are available to compliment the specific types of metals and thicknesses that you will require to produce the equipment you need. Welding has changed the frameworks of many buildings by offering a more solid foundation than rivet construction. Not only is welded steel safer, it is also cost effective. Meeting the needs of a high-production environment, our certified industrial coating line are all updated recently. SVEI has the ability to apply any required coating in one of our heated coatings facilities and apply with the procedure of pretreatment before coating. Shot blasting prepares metal parts for further processing like painting or powder coating. This step is necessary to ensure the coat adheres properly to the part. Shot blasting can clean off contaminants like dirt or oil, remove metal oxides like rust or mill scale, or deburr the surface to make it smooth. Powder coating, painting, sandblasting and beadblasting is self-owned, and galvanization is performed off site using local businesses. SVEI Welding is able to offer heavy steel fabrication solutions that are both efficiently made and highly effective. We will work for you to determine the perfect type of structural steel for your project. The processes used to design structural steel can change the cost. However, structural steel is a cost effective material when used properly. Steel is an excellent, highly-sustainable material, but it is far more effective in the hands of experienced engineers who understand its properties and potential benefits.